I finished Hayden and the Two-Way Mittens (their new name) yesterday, so I am ready for winter walking now. I'm very happy with how everything turned out. 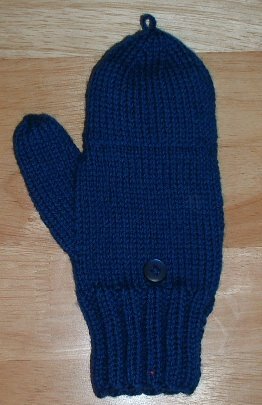 After living with the first mitten for a while, I noticed a couple of things that I knew eventually would drive me crazy, like the inside ribbing was just a little too tight, and the flap was too short and hitting the top of my middle finger. 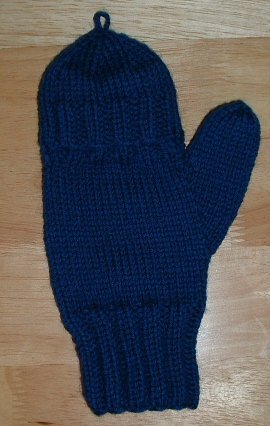 So for the second mitten I made adjustments and it was so much better that I frogged part of the first to match. Now I am satisfied with them. Please note that they are the same size--the mitten on the right has its flap pulled up a little. As for Hayden, I made a few small modifications to the pattern to suit my tastes and my knitting preferences. I cast on 100 stitches and used a gauge of 5 stitches to the inch, and I knitted for 6.5 inches before beginning the decreases. I worked out a different set of decreases, and I think it turned out really well; I like the "pouffy-er" look at the top, and it doesn't sit right next to my head but extends upward a little bit. I don't like a head-hugging cap on myself. In the Hayden hat pattern, end with round 8 when you've reached the desired length of the hat. Break yarn, run through live stitches and pull tight, secure on other side. This is a great pattern, and thank you to Poor Miss Finch for providing it. I plan to make some more of these as Christmas gifts. I think they would also be cute with a small tassel at the top. This morning, on my walk around the neighborhood, my mp3 player was acting up by shutting itself off in the middle of Alanis Morrissette and refusing to forward to the next song, so I was trying to find a way to make it work and getting more irritated by the minute. It's a long three miles for me without music, and the trouble started before I was even off my own street. The player and I finally reached a tentative truce--it agreed to work normally as long as I agreed not to touch any of its buttons, so I picked up the pace and continued on. On the next street over, a boring stretch marked by intermittent speed bumps, I saw something that changed my whole mood. Up the street I saw a man open his front door, look up and down the street, then dash out onto his front walk and down the driveway. He was a tall, husky man, and he was wearing a voluminous striped nightshirt that hit him almost at the ankle, and he was barefoot! It is 39 degrees this morning and spitting snow. He had such a fast, fluid stride, as if trying to keep his feet from hitting the asphalt. He ran to his newspaper lying near the end of the drive, then scooped it up and ran back inside. It wasn't funny, but it was so unexpected and such a bizarre sight on an otherwise tedious morning, that it made me very happy. I will never again pass by that rather plain brown split-level house without remembering how in a split second the sight of him changed my mood for the day. I love little moments like that; they're like snapshots without a camera, little serendipitous bits I can fall back on when I need to lighten my mood. Besides, I have never before in my life seen a man in a nightshirt like that, and it may be another forty years before I see one again. I've had severe start-itis this week and wanted projects that could easily be completed in an afternoon or less, since I've also been snowed under with Thanksgiving preparations and some other equally time-consuming projects. I usually get online at 5 a.m. or thereabouts (must make insomnia productive!) and find something I like, then by 7 or so start it and work on it at odd moments throughout the day. First of all, here's Tychus from Knitty. I made this in Lion Brand Woolease, in Loden and Natural Wheat. I used a provisional cast on so I could finish it with the three-needle bind off. This worked out really well, especially since I don't enjoy sewing seams. I only made four wedges, since four made the hat large enough for everyone in this house. I hope my gauge was off, because I can't imagine the head that would fit five wedges. 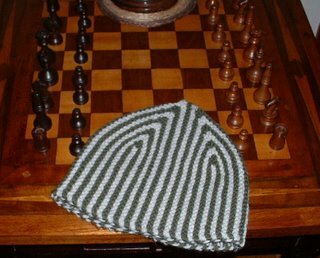 CP tried on the hat but wouldn't let me take his picture, so here it is on the chess table. Currently in progress is Poor Miss Finch's Hayden hat. I am really enjoying knitting this, though the slip-stitch pattern makes for slow progress. 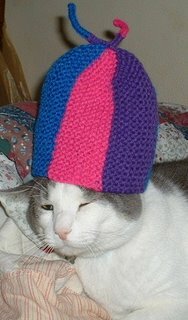 I plan to knit about 6 1/2" and then use a different decrease that makes the hat longer and less cap-like. I used Wool of the Andes, in Winter Night (matches the mittens! ), Chambray, and Cloud. I hope to wear this hat on my walks this winter. So far it seems nice and stretchy and light. I knew eventually I would have too many projects again. I'm trying to cap it at five at any one time, but if I get an idea for something, I like to start it right away. I was good and made myself finish Tychus before starting Hayden, but I keep thinking about those miniature mitten ornaments and the mini raglans. I still try to do a round or two each day on my Hourglass sweater, and later today I plan to finish up my second mitten. I must then finish the second Trekking sock. My Artisan's Vest is languishing on the shelf, but someday I will pick it up and finish it up in a marathon session. I hope everyone had a wonderful Thanksgiving. We had a great time, and the carnivorous ones among us still enjoy eating turkey and dressing every day. I have a mitten! I found some time over the weekend to write a pattern, and I eventually came up with the mitten below. I wrote down the instructions very carefully (not my normal procedure) and hope I can reproduce its mate in the very near future since snow and freezing rain is forecast for later this week. I used Knitpicks' Wool of the Andes, Winter Night, since I had three skeins of it and really thought I'd need more than one for each mitten. As it turned out, this took less than one 50 gram skein. I may make a matching hat with the rest. I knitted this at six stitches per inch, which was as tight as I was willing to knit worsted weight yarn. 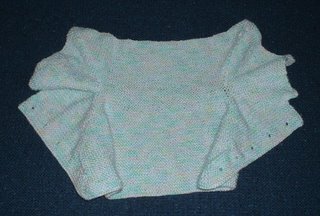 I used Elizabeth Zimmermann's Knitting Without Tears as one resource, and also the Winter 2003 issue of Interweave Knits, which had a nice article on thumb gussets. I made the flap part of the mitten by casting on half the stitches, then using the same yarn, picking up the rest by pulling the yarn through each stitch on the back of the mitten with a crochet hook. I then distributed the stitches onto three dpns and knit in the round. I love this color; it matches the trim on both my winter coats almost perfectly. The wool is pretty comfortable, too, and I'm anxious to see how warm it will keep my hands in the cold winter winds. However, I'm willing to wait on that test if it means putting off winter just a little longer. Here it is with the flap back--I had to take this shot with my left hand, and the shutter release is on the right side of the camera, hence the weird angle and blurriness. As for other knitting projects, I managed a few rounds on my hourglass sweater yesterday. The finished product will be lovely, but that is some boring knitting going on there! Well, they're not new yet. I have to design and knit them first, but after my morning walk in 19 degree, windy weather, I now know what I want in mittens for myself. Convertibles! 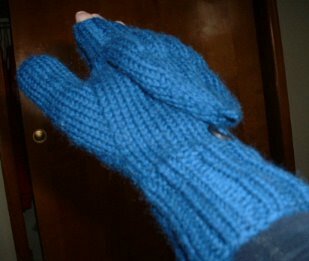 They must be done in worsted weight, so I can have that double thickness on my hands and most of my fingers most of the time. The inside part must be the half-a-mitten sort, and not the glove type where there are actual separate fingers. This will enable me to pull my thumb out and into this space with the rest of the fingers if my hands start to get too warm. It should come up rather high, just under the length of my little finger, I think. The top has to be easy to pull back and fasten and shouldn't flop around when I use my arms. They must be knitted in a fairly tight gauge so the wind doesn't whistle through. They must be done in a color that will not get dingy looking too quickly. That's my project for the next time I sit down to knit. I started the Hourglass Sweater and did about seven rounds, just past the purl round. The Cotton Fleece is sort of splitty, but it knits up really well, and I am very pleased so far. I love the coral color. 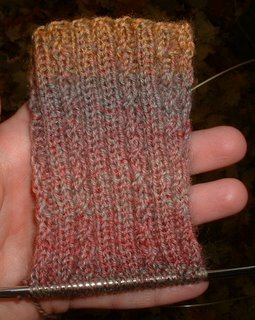 I got five skeins of Cotton Fleece in Coral Sunset for the Hourglass Sweater--this is a gorgeous color and not too far off from the photo for a change. I also got some Nature Spun in sportweight, just to have in my stash. The colors are Pink Please, Platte River Blue, Navy Nite, and Meadow Green (a lovely shade). 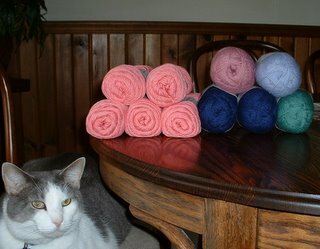 Below is my Knitpicks stash. 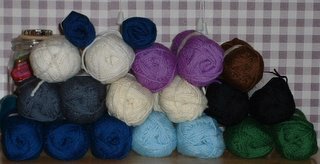 I got four skeins of Merino Style, in Dusk and Vanilla, and the rest is Wool of the Andes in Violet, Chestnut, Mist, Cloud, Coal, Winter Night, Chambray, and Grass. Grass and Violet were quite different in person than in the catalog, but I will still be able to put them to good use. In other news, yesterday most of the state was under a tornado watch for several hours. When I saw that the possibility for tornadoes was quite high, and that the alarm had spread to the national news, I decided not to take my chances here in the house, so I loaded up the cats, and we went over to BJ's. Her apartment complex has a large basement, so I felt safer at her place, and when there was a warning that a tornado was headed for our area at 60 mph, we took the cats and went down there. Let me tell you, that is a very strange and scary feeling, to be listening to the radio announcer tick off the minutes until a tornado is supposed to be at your back door, and to watch the sky turn from a dark gray-green to a bright white. Streets were deserted, except for one car pulling in at a house across the street and an older couple rushing into what must have been their friends' basement. We sat there in the stifling heat for about half an hour (the cats were so good! ), and just after the all-clear, we went back up to BJ's apartment, where I did a couple of minor household repairs for her and wished mightily for some good bourbon. I decided to stay until CP got there, so he could help me haul the cats home, and yet another line of storms passed, and yet another tornado warning was posted for our county, though out of our immediate location. It was quite a rough day, and neither of us slept very well last night, either. I'm not surprised at all to see that it's snowing today. The temperature has dropped almost thirty degrees since yesterday. Thank you, cold front! Too bad you can't arrive less spectacularly. Today I've been pretty useless, but I did buy some material and make a new valance for the kitchen window. It looks pretty nice if you don't look too closely at some of the seams. I really don't like sewing at all; I just like having sewn something. But this was a fairly easy project completed with minimal cursing. I'm off to start my Hourglass Sweater! I've been waiting on this for days. 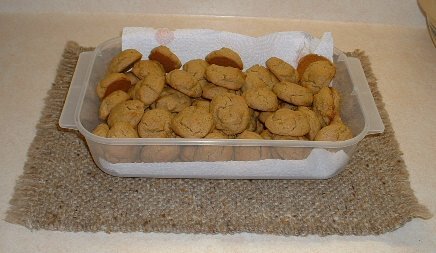 These are sorghum cookies, and they are my favorite cookies ever. I had never made any of my own before, mostly because I figured that none could ever taste as good as those Mamaw made, and also because sorghum isn't something I have sitting around all the time, and lastly, because if I made my own, there would be a good possibility I'd eat them all at one sitting. However, I had a canning jar of sorghum that was made at the antique show in September, and I had Mamaw's recipe, so yesterday I made them. They are delicious, very much like Mamaw's, though without that something special that having her make them for me would have given them. We ate several of them, but I was good and froze the rest for Thanksgiving, when there will be more people around to help eat them. I'm just waiting on the mail now, hoping for my yarn shipments to arrive, because I'm in the mood to start a new project. After all, I only have three things going, and that just isn't enough! I've been having some back trouble since the weekend, so I haven't done much except order a lot of yarn with my birthday cash. I see this morning that both orders have now shipped, so I'll soon be up to my knees in worsted and dk and sport weight stash wool, and a good amount of Brown Sheep Cotton Fleece in Coral Sunset, which I am going to use to make the Hourglass Sweater from Last Minute Knitted Gifts. I even joined the knit-a-long, even though it's almost a year old now. I'm within four inches of having the first Trekking sock completed, and it just gets more and more beautiful. I decided to keep working on the Artisan's Vest from Green Mountain Spinnery, though I had my doubts for a while. I like the looks of the vest, but in the dark gray mix I have, it looks kind of masculine. I may crochet around the armholes and the front in burgundy to "girl" it up a little, and I will look for some pretty, feminine buttons for it. Now if I only have enough yarn to complete it! At 4:30 a.m. I awoke to a fierce storm; it was raining so hard that for a long time I thought it was hail, and the wind was blowing small tree limbs down onto the roof right over my head. I turned on the TV and saw that we were under a tornado watch, so I stayed up until the ugly red and green mass on channel 8's radar moved east of here and it got quiet again. I switched over to CNN and saw that Indiana was on the national news because a tornado had touched down near Evansville and killed several people. This was particularly sad because had the storm come through in the daylight, most of those people could have been saved. As it was, it was 2 a.m., and it's November, for pete's sake, past the normal tornado season here. People were asleep in their beds, and if they had no weather alert radio, then they had no way of knowing what was coming. I've been watching all day as the death toll rises and wondering just what the hell is going on with the weather this year. It's gotten beyond scary. On a lighter note, by the time it was light here the streets were dry, so I went for a 3-mile walk, then came home and worked on the Trekking sock and continued watching the "What's Happening?" marathon on TVLand. Isn't this the most gorgeous yarn? I'm pretty happy with how the pattern is turning out, too. This one was made with TLC Baby, which is a 100% acrylic, sport weight yarn. 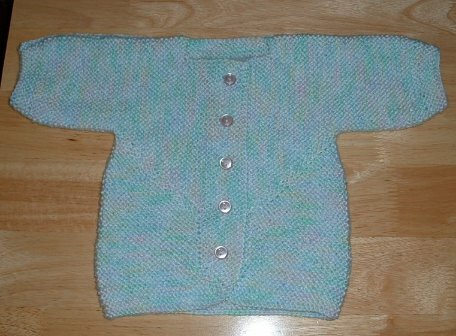 I made another one of these earlier this fall, in a blue-yellow-green colorway that better shows the mitered sides of the sweater. I thought this one, in "bunny print," would do the same, but instead it made smaller areas of color. It's pretty anyway. I started a pair of socks today. I wrote a pattern that I am very pleased with so far, and I'm really enjoying working with the Trekking XXL. 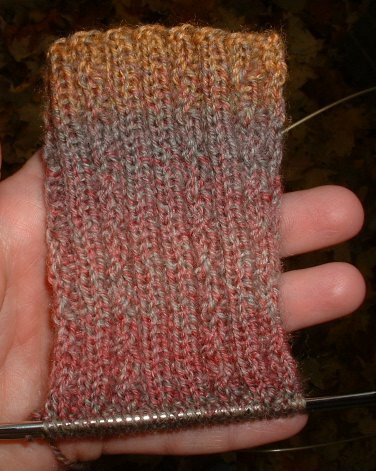 It's the softest sock yarn I've ever used, and the subtle color changes look great. I also began a Tomten Sweater in cranberry Woolease. It's coming along well, though I put it aside while finishing up the surprise sweater. I love garter stitch, especially on baby things, but I need a little break. After finishing my black and red ribby cardi, I swore I would never again make something that would need to have a zipper installed, but I couldn't resist the lure of another charming EZ baby sweater. Sigh. I looked at the cardi again today, and the zipper isn't as bad as I remembered, other than not quite reaching the collar of the sweater. I don't think anyone will notice but me. It's cloudy and a little windy today, but this morning we raked leaves anyhow, and now you can hardly tell. It seems like there are a lot more of them this year, but I don't suppose that's possible. 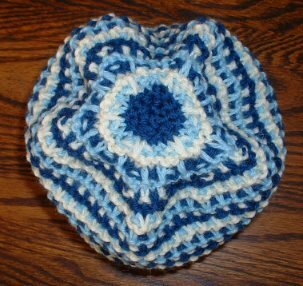 I woke up at 5 a.m. again, and while surfing the internet found a nice little hat pattern posted on the Yahoo! group knitbabysurprise. I immediately thought of those Woolease scraps of fuchsia I have been wanting to use up, so I added some purple and colonial blue and worked on this hat in between chores today. The pattern gauge is 4 stitches to the inch, but I can't do that without going up to at least a size 11 needle (which hurts my hands pretty quickly), so my hat is somewhat smaller than the child size it should be and is more appropriate for a baby or toddler. Next time I will just cast on more stitches to make the hat larger. 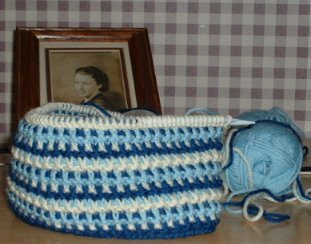 I do like the look of big fat garter stitch, and it is very cushiony and will make a nice winter accessory for someone. I will probably put it in my charity knitting bag. I'm still mulling over my future projects. 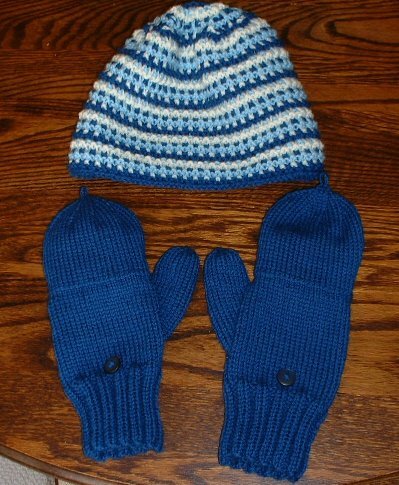 I'm sort of in the hat mood, and there are several nice patterns in Last Minute Knitted Gifts that I'd like to try, like Kim's Hats. 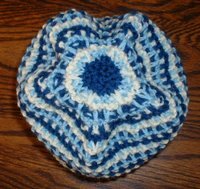 I'd like to make a cap with earflaps for my cousin's little boy, who just turned one year old. I also really enjoyed the fat garter stitch of the short rows hat and have always wanted to make EZ's Tomten Sweater, so if my infatuation continues for the next couple of days, I may start one of those. The baby surprise sweater is nearing completion. I am almost to the section where you knit on the center 90 stitches, and it'll go pretty quickly after that. My white socks are completed, washed, and blocking on the dryer right now. I can't wait to wear them; of course, the weather isn't cooperating and has gone back up into the 60s this week. I'm ready for the next cold snap.